Inhibition. We usually like to think of GABA as an inhibitory neurotransmitter, which counteracts the excitatory and potentially epileptogenic effects of glutamate. However, this is not always true during brain development. Initially, GABA is a powerful excitatory neurotransmitter. The excitatory effect of GABA has been shown to be important for brain development and the formation of dendritic spines – and the switch from excitation to inhibition is due to a single ion channel: KCC2, encoded by SLC12A5. Two recent publications in EMBO Reports now implicate genetic variation in SLC12A5 in human epilepsy. The GABA switch. Let me try to give you a brief outline of how KCC2 works. The question of whether GABA is excitatory or inhibitory depends on the intraneuronal concentration of chloride. GABA receptors are chloride channels and when the intracellular concentration of chloride is high, chloride leaves the cell after channel opening, triggering action potentials. When the concentration of GABA inside of the neuron is low, chloride enters the cell, hyperpolarizing the neuronal membrane. Early during development, intracellular chloride is high, and GABA acts as an excitatory neurotransmitter. Then KCC2 enters the scene and drastically reduces the intraneuronal chloride concentration. This leaves GABA as the inhibitory neurotransmitter that we know. It is, however, fascinating that this is due to a single protein. It’s easy to imagine that disruption of KCC2 might lead to downstream problems with GABA action, leading to hyperexcitability. The genetic evidence. 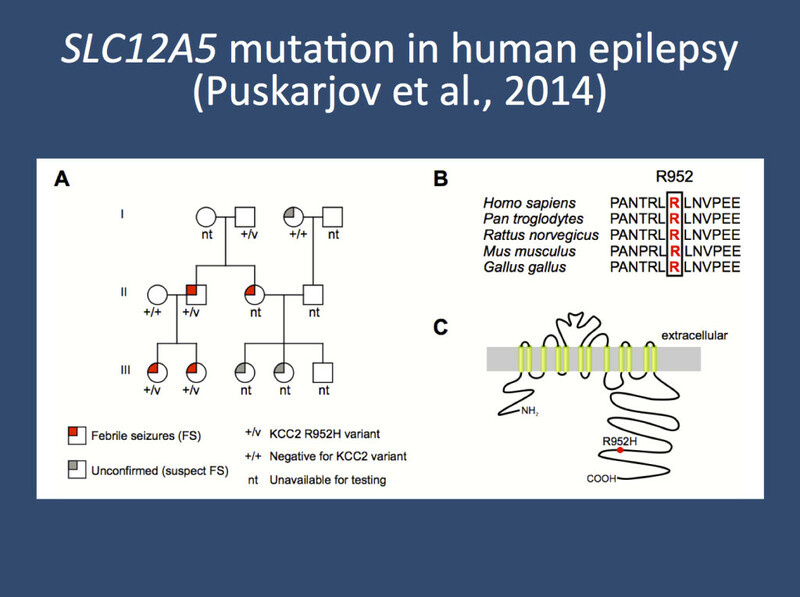 Both Puskarjov and collaborators and Kahle and collaborators hypothesized that genetic variation in SLC12A5 may lead to seizures and sequenced this gene. Puskarjov and collaborators identified a family with febrile seizures with a R952H variant, a variant previously annotated in dbSNP (rs142740233). This variant is very rare and was only found in 7/~6500 individuals in the Exome Variant Server (EVS). Kahle and collaborators sequenced SLC12A5 in 380 probands with Idiopathic/Genetic Generalized Epilepsy and found the same variant in 5/380 probands and 7/~1600 controls. While not statistically significant on a genome-wide basis, this suggests an intriguing enrichment in patients. In addition, Kahle and collaborators found a second variant in the C-terminus of KCC2 (R1049K) in three patients and a single control individual. The function. Puskarjov and collaborators investigated the effect of the R952H variant. In mouse neuronal stem cells, this variant led to a reduced surface expression, and when introduced into young rodent pyramidal neurons, the R952H variant led to significantly less chloride extrusion than the wildtype. In addition, the effect of wild type KCC2 in inducing dendric spines was impaired, demonstrating how the GABA effect is tightly coupled with maturation of the CNS. Stats versus function. There are two competing philosophies when it comes to interpreting the significance of these findings. (1) First, there is the conservative genomic concept, influenced by our difficulties in reproducing findings and awareness of the amount of genomic variation in the human genome. According to modern genomic criteria, even the joint finding of both studies is not significant. The p-values reported by Kahle and collaborators do not reach 0.05 significance level when corrected for multiple testing of two variants. Also, segregation in the small febrile seizure family reported by Puskarjov and collaborators is compatible with random segregation of a rare variant. (2) Secondly, there is a mixed genomic-functional concept. This concept accepts the fact that it is difficult to generate sufficient genetic evidence for an association for rare variants and derives additional information from functional studies as in the study by Puskarjov and collaborators, which provides convincing functional data that shows a functional consequence of the R952H variant. Conclusion. KCC2 encoded by SLC12A5 is an interesting candidate gene for epilepsy, given its central role in controlling the inhibitory effect of GABA. Both studies by Puskarjov and collaborators and by Kahle and collaborators stumble upon a rare variant in the SLC12A5 gene that might predispose to various types of epilepsies including IGE/GGE and febrile seizures as a rare genetic risk factor. SLC12A5 is one of the top 5% mutation intolerant genes in the human genome and has previously never been found as a de novo mutation in epilepsy, autism, intellectual disability, or schizophrenia. It will be interesting to see how the genetic evidence for this variant and other SLC12A5 variants accumulates in current large-scale exome studies. This entry was posted in 2014, Epileptic encephalopathy, Familial epilepsies, Papers and tagged CNS maturation, epileptic encephalopathy, febrile seizures, gaba receptors, GEFS+, Genetic Generalized Epilepsy, GGE, Idiopathic Generalized Epilepsy, IGE, KCC2, Malignant Migrating Partial Seizures of Infancy, MMPSI, SLC12A5. Bookmark the permalink. I just corrected a minor mistake in the blog post. One of our readers had pointed out that I mixed up GABA and chloride once in the second paragraph. It’s corrected now.